In our continued efforts to make Podbean the easiest, most functional podcasting platform for you, we’ve streamlined some more account features. We have removed the “users” menu. You can now find features such as admin, authors in the “my account” page and the “private members”page, if you’ve set up the private podcast, located under “account” in the upper right hand corner when you log in to Podbean. “Pages” functionality: You will now find “pages” under the “layout” tab (previously under “publish”). Pages function as a brief description of the podcast. Pages will now be text only . However, if you were using “pages” before and attaching audio and video files, your account will maintain those features. The toolbar and comments will also be removed from the bottom of the page. Embeddable players: Podbean now supports an embeddable player for https sites, with options for a single-track or multi-track player and customization. Learn how to embed a player on your own website, blog or social site at: http://support.podbean.com/customer/portal/articles/865956-how-to-embed-my-podcast-on-my-own-site. Creating categories: We’ve simplified the process for creating a category. Rather than having a category menu under the “publish” tab, you can now simply create, edit or delete a category directly when you are publishing an episode. Easier Layout Features: 1. Easily choose your header and background images. You can now adjust the header image and background image when you select a theme (rather than having to go under a separate tab for header image/background image). 2. We have streamlined by removing some of the less-used/relevant widgets. However, if you have been using a particular widget, that widget will remain available in your account. 3. Sidebar links are now easier than ever to configure! Simply drag and drop the link widget into the sidebar. Click the configure button to create, edit or delete the links directly. We’re always working to make Podbean the best podcasting tool for you. Your feedback helps us improve. We’d love to hear what you think! Email us. It’s been a couple weeks since we released the new, enhanced Podbean statistics platform and we’ve been hearing from users who have been trying it out and enjoying better insight into their audience. We’ve also been getting a lot of suggestions for improvement and questions about particular features.We thank you, as this user feedback is vital so we can continue to offer the best platform for podcasters. Our new platform had removed feed hits in favor of other data, but users commented that they wanted to be able to continue viewing feed hits. We have already reinstated this feature under the “feed hits” tab. Feed hits shows how many times your feed is fetched. We have heard from some users about the removal of site visits in the new platform and we understand the value of analyzing your site’s popularity. In order to bring you the best functionality, we determined it was best to allow users to link their site with google analytics. Visit the “google analytics” tab in your stats to add your google analytics account ID. This will give you the richest insight into your podcast site traffic and marketing effectiveness. The most recent plays stats were initially removed from the new tool, but can now be found again under your “trending” and “Feed Hits” report. Scroll down and you will see “Episode Player Data (Latest 50)”. 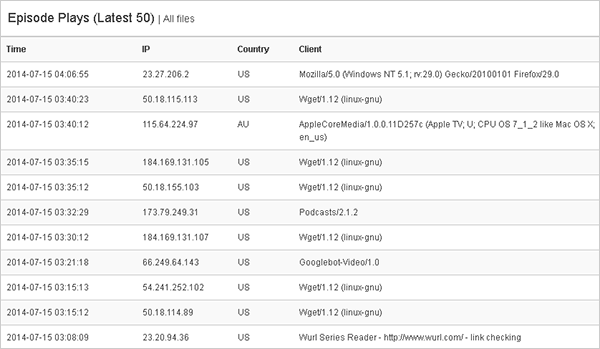 Here you will find data on the latest 50 plays including: time, ip, country and client. We encourage your continued feedback as you try out the new tools. Podbean strives to offer the best features while maintaining simplicity for our users. We want to make it easy for you to have the best podcast possible, so let us know what you think. The Podbean team is excited to offer two new podcast hosting plans that allow podcasters to publish an unlimited amount of audio and video each month. Podbean now offers two great new storage plans: an unlimited audio plan for as little as $9 a month and an unlimited video plan for as little as $29 a month (when purchased annually). The plans, which are part of Podbean’s new “No Limit Podcasting” campaign, are a significant upgrade over storage maximums set for most podcast hosting. 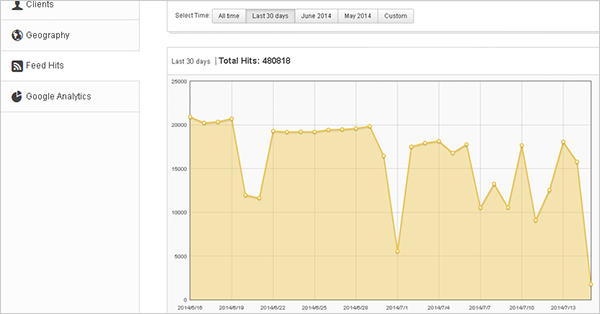 Until now, storage offered by podcast hosting service providers at the $9 a month rate was typically 300MB of space. • Professionally designed, customizable templates that can be presented across desktop, iPad, iPhone, Android and other mobile devices and that allow podcasters to quickly and easily develop their own unique style. • A user-friendly interface that integrates widgets and publishing, management, syndication and analysis tools into an easy-to-use podcasting package. • A point and click environment that allows users to publish, manage and promote podcasts without any technical knowledge. • Embeddable code that makes it easy for publishers to integrate podcasts into their own websites, blogs and social networks around the web, including Facebook, Twitter, Google+, Blogger and more. • Comprehensive statistics that reveal, among other things, how many times each episode is played, a feed is fetched and a site is visited; plus, when and who played a podcast. If purchased on an annual basis, the unlimited audio plan costs $9/month and the unlimited video plan costs $29/month. Customers who wish to pay monthly rather than purchase an annual plan can receive unlimited audio for $14/month and unlimited video for $39/month. Podbean’s Support Team has a new video FAQ available for you to get started publishing your podcast. Our video tutorial is a step-by-step visual guide that walks you through how to publish a podcast with Podbean. Our user-friendly interface makes this process super easy, so just take a few minutes to watch the video and you’ll have all the information you need! Click here to view the video (you can also view it via YouTube. If you have any additional questions or difficulty getting started, visit our support center for FAQs or to contact us. Podbean just launched our revamped statistics system to give podcasters better insight in to their podcast’s performance and audience. With Podbean’s enhanced statistics system, podcasters can now get information about their podcast audience to understand who the listeners are, how they found the podcast, when and how they play the podcast, where they’re located, their favorite episodes and more! The Podbean Statistics System provides graphical views of key statistics, so you can tap into the important information you need to help your podcast succeed and grow. And, unlike other systems, Podbean includes all of this with your account*, so there’s no extra cost for the information you need! Check out your new stats today and let us know what you think! * All paid accounts include the Podbean statistics system. 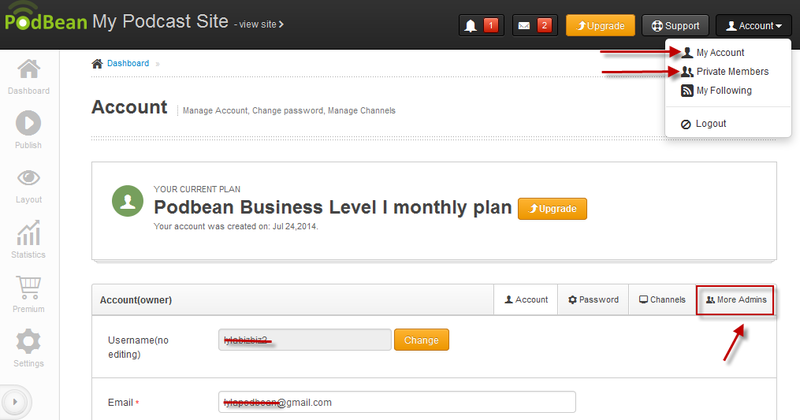 Professional plan users get additional reporting capability. You will see more detail in your statistics system, with the option to upgrade if desired. We removed site visits and feed hits as they are not the most accurate representation of popularity due to the prevalence of social share and mobile visits. 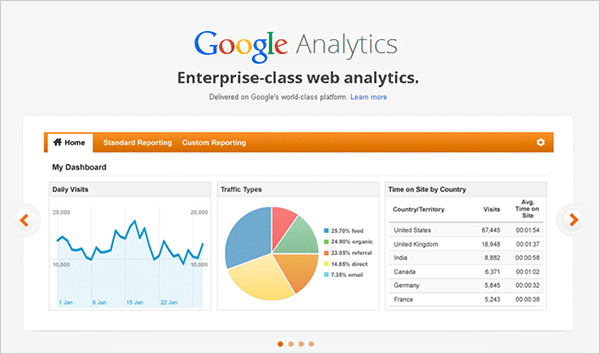 You can consider professional Google analytics for more detailed data.